A new augmented reality app lets you chill out with the Merc with a Mouth while at 7-Eleven. Heading out to a 7-Eleven (if you have one near you, that is) is always fun. You can grab some snacks, a Slurpee, hang out with Deadpool...wait. Did I just say "hang out with Deadpool?" You bet I did. A new 7-Eleven promotion is using the power of augmented reality to promote the upcoming superhero flick Deadpool 2, and you can get in on the fun too. 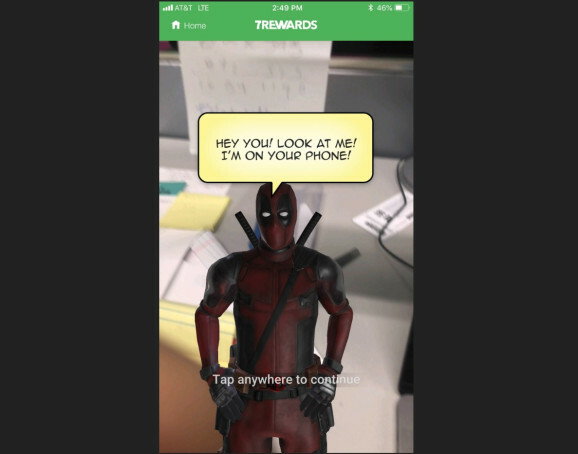 Deadpool 2 opens in theaters on May 18, and 7-Eleven will be introducing a ton of promotional tie-in products and promotions to go along with it, which includes a smartphone-based AR experience that you can use to interact with Ddeadpool. You'll download a special app and then use the camera to take a selfie with Deadpool, which he'll then ruin with marker doodles, and scan special "zap codes" in-store while the wise-cracking hero gives you his thoughts on everything in the store. There will be a new set of activities you can complete each week in a bid to keep fans interested and coming back for more. It sounds like a fun way to promote the new movie, and if you're a Deadpool fan this is the closest you're going to get to having him scarf down some chimichangas while hanging out at the convenience store with you for now.